Disclaimer: Once again, this is a very old post so please forgive the photography. Rina used her old Sony something-something Phone Camera. From Cagayan to Cebu to Bacolod and finally Manila! As I've mentioned before in my previous posts, I lived a great deal of my younger years in the beautiful island of Cebu. At that time, though, the food choices weren't as vast as it is today. If you wanted Filipino food, you went to either Golden Cowrie or Lighthouse. If Chinese is your thing, You went to Ding Qua Qua or Ding How Dimsum, and Japanese food lovers could go to Ginza or Mikado. The annoying thing about Cebu for me, is that the city's boom seems to have coincided with my departure to Manila. It's almost as if my presence in the city caused the economy to stagnate for so many years. In all seriousness though, I feel the big boom had more to do with SM and Ayala setting up shop there, than me being a jinx to the whole city (Fingers crossed).When those two establishments opened up, an influx of businesses came into the city, and local businesses saw potential to expand their market. 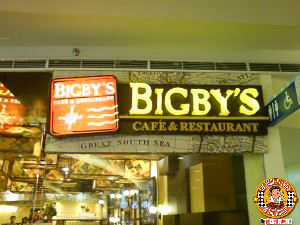 During a Mall tour that I was tasked to direct a few years back, I noticed the sign of "Bigby's cafe & Restaurant". The design had an "New World" feel to it.. where it kind of looks like something off a map of Christopher Columbus. At first glance, I honestly thought it was an international franchise. I suggested this place to the client I was with, and luckily (for me), she said that when she had gone around the mall herself earlier, "Bigby's" had caught her attention as well. So dinner at Bigby's was set. Is there any other trip I know? I don't remember what day that was. I can't recall which mall show it was I was in Cebu for. But I remembered what I ordered in Bigby's. The Stuffed Pork Chop. But now comes the funny part- I can't recall what it was stuffed with. But all I remember It was absolutely delicious. It was so good that a few years later, when I was in Bacolod for yet another show, I saw there was a Bigby's in one of the malls there, and I knew I had to go back for it, because I had no clue when I'd be able to go back for it again. A couple of years later, while Rina and I were checking out the new Atrium building of Megamall, I was so elated to find out that they had opened a Bigby's right here in Manila, I almost did a quadruple back flip! I explained to Rina that this was the place that the Stuffed Porkchops I was raving to her about. So you can only imagine how my heart broke into a million pieces when the manager regrettably told me while i desperately scoured the menu for the legendary Stuffed Pork Chops.. that for some reason that I still cannot fathom to this very day.. they removed it from the menu. He might as well have removed a piece of my heart.. sniff. Wow I didn't realize I spent so much time telling you what I didn't eat, I almost forgot to tell you what I did! No amount of whining could bring the pork chop back, Rina said, so just make do with what's on the menu (I still think she was wrong though). Nevertheless, I am glad she made me check out the menu, because despite the departure of the Stuffed Porkchops from their lineup, there still is a mouthwatering array of choices to be made. 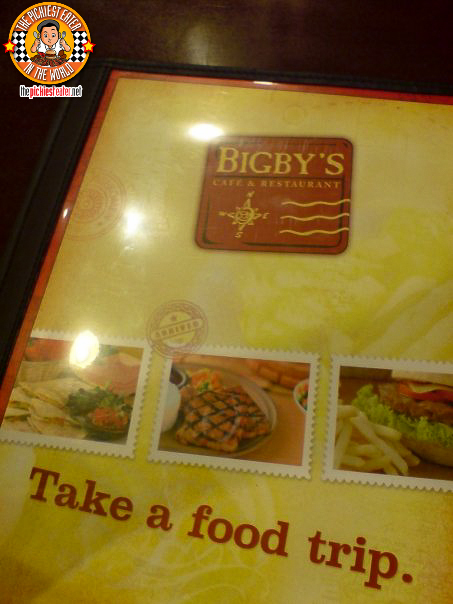 The whole point of the map is to make you believe that dining in Bigby's brings you to a whole new world experience. A diverse menu that features good old' fashioned American BBQ's, to Mexican favorites, to Asian delights Bigby's promises you a culinary journey of a lifetme. At a glance, the menu won't sound like much of an adventure, as it presents to you simple classics that will ring a bell, such as "Chicken in a basket", "Uncle Sam Roast Beef", and "Belly Sizzler's" But in all honesty, for me, that's what I love about it. 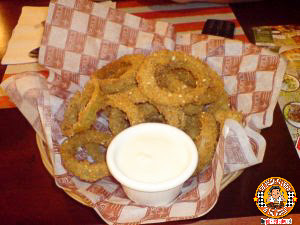 The menu is peppered with familiar items given zany monikers of dishes from different parts of the world, just to add to the fun Bigby's experience. As usual, we started with the Sweet Onion Loops (₱139.00) was hoping for something close to the Onion Loaf of Tony Roma's, but of course, it fell short. That doesn't mean it wasn't good though. The loops were crunchy with every bite, and when dipped into the rich sour cream sauce, and the onions did have a slight sweetness to it that helped the dish live up to it's name. To me, there's nothing sexier than a woman who can eat, and I don't think i've met anyone who can eat like my wife does.. making her, the sexiest woman in the world bar none. I swear, there is meat somewhere on that sizzling plate, despite what it may look like..
Has this ever happened to you: You go to a restaurant with your mind set on what you want to order. You get there, settle down, and tell the waiter what you want, only for you to find out that it's not available. Suddenly nothing on the menu seems good enough for you, but you have to order something soon because the person you're with knew what she wanted within seconds of picking up her menu, and she has stressed to you how hungry she was? So now you're trying to pick a dish that could possibly live up to what you had in mind earlier, but no matter how hard you try, or not matter how good everything else in the menu sounds, you're just not feeling it, so you end up succumbing to the pressure and you end up ordering the dish that feels the most familiar and comfortable to you. 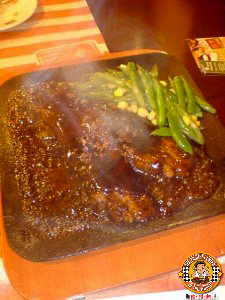 That's how I ended up ordering the Belly Sizzlers (₱235.00). After drawing a blank for five minutes I ended up ordering "sizzling liempo". Within minutes I regretted it, not for any other reason than there were far more creative entrees in the menu that could've tried out. Like I mentioned earlier, it took Rina seconds to find Granny's Chicken (₱299.00) You smother anything in cheese and it's quite likely Rina will order it. Under the generous layer of melted mozzarella cheese was a coating of pesto cream that melded well with the chicken to create a comfort dish only someone's Granny could create. Again, the string beans seemed more annoying than helpful though. Regardless, Granny's Chicken was really so loaded on it's own, it didn't need any side dish. Definitely a must try. My new September resolution will be.. I will go back to Bigby's some day, and I will not get frazzled anymore. Besides, with all the yummy sounding dishes they have to offer, I'm ready to move on from losing my beloved Stuffed Pork Chop. I can't believe I missed out on dishes like "Captain Jack's 9 oz. Rib Eye Steak" and their Parmesan breaded "Passion Fish"! 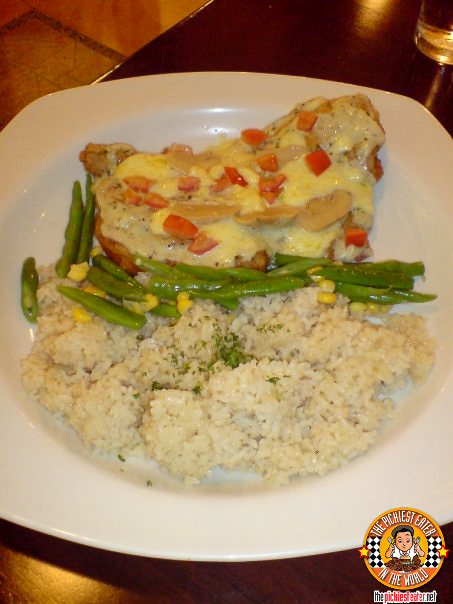 Until my next food trip to Bigby's.. Oh yes, we shall meet again.. Sad to say Bigby's at Megamall has already closed. SCHATZI MEETS UNCLE CHEFFY ! YEEHAAWW!!! WE'RE AT TEXAS ROADHOUSE GRILL! KRISPY KREME : KRUFFINS VS. PULL APARTS! GROCERY FINDS: PANDA EXPRESS ORANGE SAUCE! SORRY JOLLI, THERES A NEW KING BEE IN TOWN!